I recently saw the book ‘Table Style’ by Rebecca Tanqueray and Liz Belton when I was in the Paperchase shop in Tottenham Court Road in London. The photos in the book were absolutely beautiful, so much so that I decided to make a note of the photographer and find out more about her. Her name is Debi Treloar and this post features some of her stunning images. Debi’s photos show that you really don’t need a lot of flowers to brighten up your home…nor do you have to take a lot of time in arranging them. 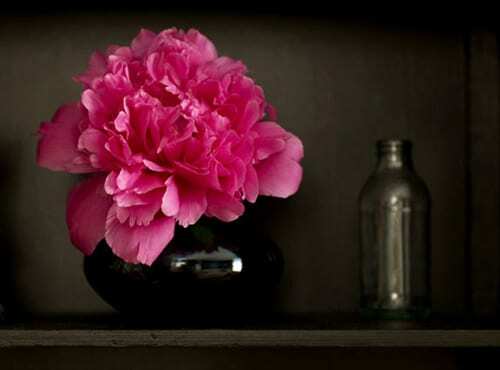 Simply choose a container such as a vase, jug or tumbler and add a single bloom. You can use just about anything that holds water…a pretty flask is even featured in one of the photos below! Another way to arrange flowers in your home is to place individual blooms in an assortment of containers and group them together. 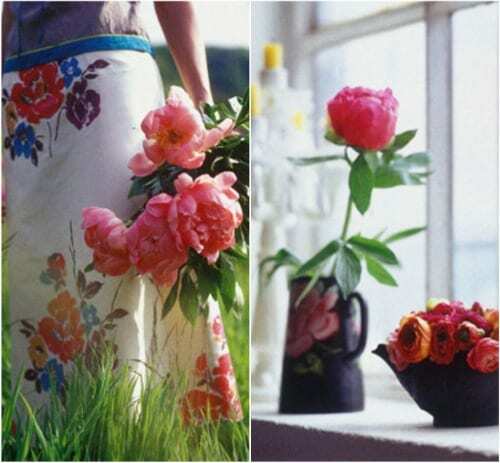 Don’t these images of peonies and ranunculus conjure up summer? 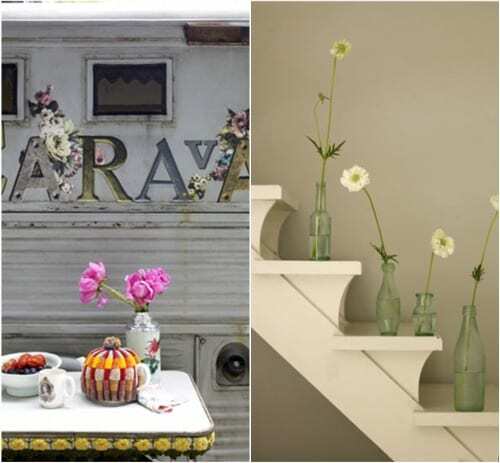 The image on the left below has such a vintage feel, with the cute multi-coloured tea cosy, florally-decorated caravan in the background and the peonies. Individual white scabious flowers are featured in the photo on the right. 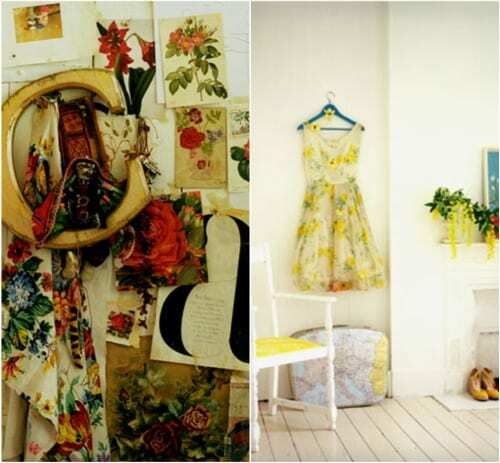 I love the combination of these old floral postcards and material in the picture on the left below…it could be someone’s inspirational mood board. Last, but not least, is a very spring-like photo with a floaty yellow flowery dress. A little bit of background about Debi….she’s from Zimbabwe and studied photography in South Africa. She specialises in photographs of interiors and food, and although she’s now based in London, she travels all over the world for her work, which you’ll see in magazines such as Elle Décor, Red, Olive, Homes & Gardens and Country Living. Recently her photos have been published in the British version of the Australian online publication Adore Home, a new lifestyle magazine available exclusively online. She has also produced the photographs for over 30 books on interiors and food that have been published globally in different languages, including ‘Bazaar Style’ with Selina Lake and ‘Contemporary Country’ with Emily Chalmers. Whilst writing this post, I learnt that Debi is the photographer on Holly Becker from Decor8’s eagerly awaited new book, ‘Decorate’ which is due out in the UK next month. It will be available in Australia in April, the US in May and Germany in September. I’m starting my digital photography course next week…which I’m so looking forward to. However, I think that it may take me just a little bit of practice to take photos anywhere near as captivating as Debi’s! Oh, I LOVE HER WORK! You’ve picked some great images – the first one is just a piece of brilliance, is it not?